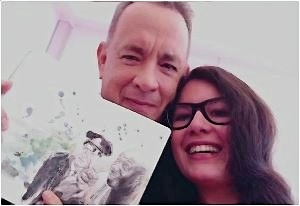 Denise Esposito expressed her appreciation for her favorite actor, Tom Hanks through an art book filled with her drawings of his popular characters. The Italian fan sent her art book to the actor’s P.R. team. Then, she was called and informed that the 60-year-old actor wanted to meet her. When they meet each other, the actor appeared to be overwhelmed by the drawings while saying, “This is, this is…” The fan suggested, “It is so beautiful, really.” And the actor carefully looked at the pages and claimed, “Oh my Lord… oh!” He also recognized which movies the characters were from as he went on saying, “League of their Own,” Sleepless in Seattle,” “Philadelphia,” “Forrest Gump,” there’s “Apollo 13,” “Toy Story 1,” [and] “Sully.” He had also looked at the last page and read “And to be continued.” He expressed his gratitude by saying, “Thank you so very… give me a hug. Thank you so very much, ” as well as giving her an autographed typewriter with a special note.